This is how professionals resample images UP for BIG PRINTING using Photoshop... you can too! Hey guys, let me show you how graphic design professional sign companies and photographers RESAMPLE their original images using Photoshop to super huge sizes without losing color data. It's easy. It's all done via Image Size and 72 d p i. We'll need 3 steps to achieve it... and the Resample Image and Percent functions are the key factors here. Step One: Change the original photo resolution to 72 dpi. The pixel count remains the same, but now their dimensions are much larger. Resample via Percent is very powerful and you'll see the image becomes very big and stays beautiful. It's a secret not many know. Resample the image to percent. Step Three: Check the RESAMPLE IMAGE option box, then click OK to apply. The image will redefine without losing any color data blocks. It's how professionals and designers increase image size for large format printing. Now... from the original base image photo size, we have a huge 8.6 metre or 26' foot image that can be used for outdoor billboards, printed banners, posters and more. The image remains sharp and won't suffer color loss or pixelation. You'll be able to send this new image to a printing company. The key is that 72 dpi = the native raw format. When you work 1:1 at 72 dpi your program is pulling in raw data. Let me show you why vector logos are better too. Vector logos are drawn lines, not pixels. They can be resized and keep their sharp edges. This logo is now over 2 metres 8 feet wide. Choose actual pixels and you can see the eges are neat and trim without blurriness. Now the logo and imagery are perfectly matched and will output fantastic print results. A final check, and there it is... a super size billboard banner in less than 90 seconds that keeps all the professional qualities your need for large format banner and sign printing. 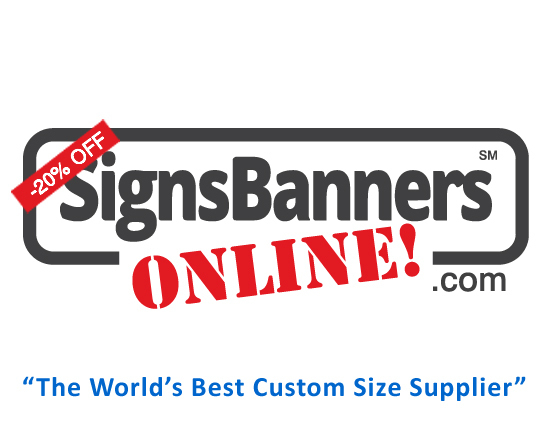 You'll find lots more helpful and fantastic design tips at the new Signs Banners Online Learning Center... and it's free.